systematics (Adoutte et al. 2000; Giribet 2002; Pennisi 2003; Halanych 2004; Peterson et al. 2004) and through precise, absolute dating of fossiliferous Late Neoproterozoic and Early Cambrian sections, which allowed the establishment of a reliable chronostratigraphic framework (Martin et al. 2000; Knoll et al. 2004). Possibly the oldest metazoans are ring- and disk-shaped impressions from the Mackenzie mountains in northwestern Canada, dated as 610-600 Ma and hence of the same age as the terminal Marinoan-Varanger glaciation. This soft-bodied fauna was called Ediacara assemblage I and represents perhaps cnidarian grade animals (Erwin 2001a). 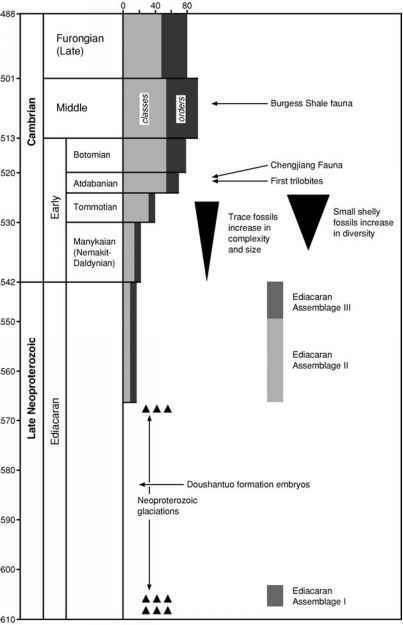 Considerably more diverse but younger Ediacaran assemblages are known from a number of localities around the world (Bottjer 2002; Brasier and Antcliffe 2004). The fauna of these Ediacaran assemblages II and III consists exclusively of soft-bodied forms. The body wall of these organisms must have been quite rigid as is evident from the taphonomic behavior of the Ediacaran biota. They are preserved, mostly intact, as impressions at the base of event beds (storm layers, turbidites) that quickly buried them (Erwin 2001a; Bottjer 2002). Most of the forms are flattened, segmented or quilted, and some of them attain considerable sizes (Narbonne and Gehling 2003). Classification of these organisms has been highly controversial. Traditionally, the various species were assigned to extant groups like medusae, sea pens, polychaete worms, and stem group echinoderms (Wade 1972a, b; Glaessner 1983, 1984; Jenkins 1992), with most of them belonging to cnidarians. Today most researchers believe that the majority of the enigmatic Ediacaran organisms represent "lost constructions'' (Seilacher 1989, 1992; Buss and Seilacher 1994; Narbonne 2004, 2005). With the exception of the 555-Ma-old Kimberella, which is now considered to be an ancestral mollusk (Fedonkin and Waggoner 1997; but see Dzik 2003; Budd and Jensen 2004) and therefore the oldest body fossil of a bilaterian, Ediacaran organisms seem to lack a mouth and a digestive tract. Most were immobile, many of them recliners but some also mud-stickers (Seilacher 1999). Nutrient uptake was either through the body surface, or these organisms lived in symbiosis with photosynthetic/chemosynthetic protists or bacteria (McMenamin and McMenamin 1990; Narbonne 2005). Although sponges and cnidarians were most probably also present, predators were notably absent. The immobile organisms thus lived in a "Garden of Ediacara'' (McMenamin and McMenamin 1990). The sediment surface was frequently sealed by microbial mats that were not disrupted by larger burrowing animals. Traces including some radular scratch marks are small and rare and are proof of the presence of bilaterians. Claims for evidence of bilaterians earlier than the Ediacaran assemblages (e.g., traces from 1200-Ma rocks in India; Seilacher et al. 1998) are published with some frequency but these are not accepted (Erwin and Davidson 2002). An exciting new window into Late-Proterozoic life recently opened with the discovery of 600-580-Ma-old fossiliferous phosphorites at Doushantuo, southern China (Xiao et al. 1998). In addition to various algae, microscopic metazoan embryos preserved at the cellular level were found. The affinities of these early cleavage stages are unclear but they might possibly be of bilaterian origin (Knoll and Carroll 1999; Valentine et al. 1999). Newer claims for small bilaterian animals (Vernanimalcula) with preserved coelom and digestive tract from the same locality (Chen et al. 2004) are not widely accepted (Stokstad 2004). The Ediacaran biota largely went extinct at the Precambrian-Cambrian boundary (Brasier and Antcliffe 2004) with perhaps a few survivors into the Middle Cambrian (Conway-Morris 1993). The base of the Cambrian, which is now dated at 542 Ma (Gradstein and Ogg 2004; Ogg 2004), marks the beginning of an interval which is the most remarkable in the history of life. During the Early Cambrian, a wide range of skeleton-bearing animals made their debut, and within only 20 Myr, almost all phyla with preservable hard parts entered the fossil record (sponges already earlier, bryozoans in the Ordovician, but might have exclusively soft-bodied representatives in Cambrian; Valentine 2002, 2004). This apparent explosion of animal bauplans, which had already puzzled Darwin, is still one of the greatest enigmas, although it has become clear in the last few years that there was a prelude of perhaps tens of million years (Lieberman 2003) seen both among traces and in the shelly fossils, but no lengthy time gap between the Ediacaran assemblages and the lowermost Cambrian (Knoll and Carroll 1999; Erwin 2001; Valentine 2002). At first we see an increasing size and complexity of burrows/traces across the Precambrian-Cambrian boundary and then an ever increasing diversity during the Early Cambrian (Crimes 1992,2001; Droser and Li 2001). In parallel, there was a huge diversification in the so-called "small shelly fossils'' (Rozanov and Zhuravlev 1992; Conway-Morris 1998, 2001; Grotzinger et al. 2000). The appearance of new animal phyla and other higher taxa was concentrated in an interval between the latest Manykayan and the Atdabanian spanning perhaps 10 Myr, and this interval is called the "Cambrian explosion'' and saw even the appearance of phyla that shortly thereafter became extinct (Dzik 1993; Valentine et al. 1999; Conway Morris 2000). By the end of the Cambrian explosion, the phylum-level diversity among marine animals had surpassed that seen in today's oceans! During this interval, biomineralization was acquired by a multitude of organisms, including mollusks, brachiopods, echinoderms, and chordates (see Lowenstam and Weiner 1989; Bengtson 1994; Zhuravlev and Riding 2001 for an overview). Complex arthropods, like trilobites, enter the fossil record during the Atdabanian stage, and by the Middle Cambrian, a plateau in diversity was reached. Our picture of the Cambrian explosion is facilitated by several wonderful, exceptional fossiliferous settings (Fossillagerstaetten), including the Early Cambrian localities of Chengjiang (China; Xian-guang et al. 2004) and Sirius Passet (Greenland; Conway Morris 1998), and the most famous Middle Cambrian Burgess Shale (Canada; Briggs et al. 1994). Several very important questions surround debates about the Cambrian explosion. (1) Is it real or just an artifact of the imperfect fossil record? (2) Does the origin of metazoan phyla substantially predate their appearance in the fossil record? (3) If the event was real, what was the triggering mechanism? The current consensus is that the Cambrian explosion was indeed real and happened in just a 10-Ma interval between the late Manykayan and the Atdaba-nian (Valentine et al. 1999; Conway Morris 2000; Erwin 2001; Valentine 2002, 2004). Yet the Cambrian explosion does not record the initial split of the metazoans but rather the diversification of the three fundamental metazoan groups into the crown groups and the modern phyla (Douzery et al. 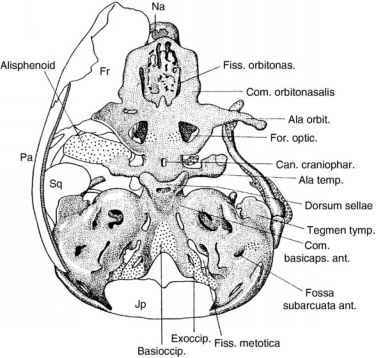 2004; Peterson et al. 2004; Valentine 2004). Ecologically, the Cambrian revolution led to a massive restructuring of the marine benthos. An increasing percentage of animals were burrowers that fed on nutrients within the sediment, or that constructed tubes. As a consequence of the increasing bioturbation (Droser and Li 2001), the sediment became destabilized and the superficial microbial mats were lost. This "agronomic revolution'' (Seilacher 1999) led to an uppermost mixed layer, and besides the Ediacara organisms, many immobile recliners and mudstickers like the helicoplacoid echinoderms went extinct (Bottjer et al. 2000; Dornbos and Bottjer 2000; Dornbos et al. 2005). (Conway Morris 2001; see also Stanley 1973) and perhaps also the evolution of animal vision (Parker 2003), thereby allowing new adaptational opportunities. The Cambrian saw indeed the appearance of many carnivores and scavengers, and this trophic group accounted for up to 25% of the species in the Middle Cambrian (Burzin et al. 2001). Furthermore, the development of planktonic habits in a range of groups greatly increased the complexity of food webs and was also responsible for animal diversification (Butterfield 2001). Many paleontologists were deeply impressed by the wide variety of different body plans, especially among arthropods, that appeared during the Cambrian explosion. The number of taxa known from the famous Cambrian Lagerstaetten that do not fit easily into any classification scheme based on living animals is extraordinary. It was claimed that morphological disparity among Cambrian animals was even higher than that seen today (Gould 1989, 1991) and some extraordinary evolutionary mechanisms acted during the Cambrian explosion. Measuring morphological disparity is a relatively new field and seems to be a promising avenue to complement measures of taxonomic diversity (Foote 1997; Wills 2001). Detailed analyses of arthropods showed that disparity among the Cambrian forms was not higher than among modern species and the level of appendage specialisation is much higher today than in the Cambrian (Briggs et al. 1992; Wills et al. 1994). Special evolutionary processes do, therefore, not seem to have operated during the Cambrian explosion. Yet it remains nevertheless remarkable how early and synchronous the multitude of higher animal taxa appeared in the fossil record.